Posted on 5/23/2017 by Jacob Share. 0 Comments. Here at Michael Management, we get a lot of questions through our chat, info box and email. 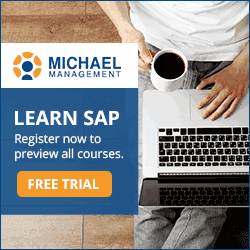 Many people looking for SAP Training are improving their resumes and seeking better opportunities. We found great guest bloggers to help give our students advice. Here are some great tips from Jacob Share on how to manage gaps in your resume. You can't fill in employment gaps on your resume without lying, so do this instead. Need a better way to explain what you did between jobs? Trying to re-enter the job market after a long time? Here's how to explain your resume gaps. Not all resume gaps are signs of poor job searching, sometimes there are good reasons for gaps in employment. “In August 2001, I resigned from my managerial position at Amazon.com in France because I wanted to move back to Israel. My plan was to take some time off to get settled in Jerusalem properly, without rushing, and then relax because I was exhausted from working at Amazon. Once I was feeling energized and ready to go back to work, I began evaluating what my best career options would be locally. Unfortunately, by the time I began looking for work in December 2001, the Dot-com Bust (or ‘Internet Crash', as they said here in Israel) was in full swing, companies were closing, hitech (tech industry) people were being laid off left and right, and almost none of them were going to be replaced. I spent the next 8 months looking for work like so many other people, receiving only a few offers that I had to refuse because they didn't make sense financially. One company offered to pay LESS than minimum wage to hire me as a Senior Project Manager (a position that normally earns 8-10 times that amount). I would have had to take a second job to pay all my bills. Good thing I didn't join them, they went bankrupt 3 months later. In the summer of 2002, one of my former bosses from Amazon said that if I came back to France he would give me a terrific job with his new company. With my savings dwindling and an appealing offer in hand, I couldn't refuse. I wasn't laid off or fired, I resigned. It was my choice to become unemployed. Needing time after a transcontinental move is very understandable to get settled in, and it takes more than a week. Saying that “I was exhausted from work” is a mistake unless you can convince the interviewer that it won't happen again at their company. That said, everyone knows that hard work is tiring and this “slip” of truth can actually work in your favor by showing your honesty. Anyone who's been through the ordeal will remember what it's like to be in industry- or economy-wide recessions, and how difficult the job market is during those moments in time. No one will fault you for getting caught up in such events that were clearly out of your control. Not only was it my choice to become unemployed, it was my choice to stay unemployed. Also, it was worth pointing out that although there weren't many, I was still getting offers during a tough time. Any HR rep. or recruiter knows that a hiring process can take a few months before the candidate actually becomes an employee. Finally, it's important to emphasize that when telling this story to recruiters during my 2006 job hunt, I wasn't an expert on job search. My above reply was a result of simply trying to tell the truth in a positive light and seeing how people reacted, including their followup questions or remarks. Don't try to hide the gap. Many people have prolonged periods between jobs, at least once in their career. Think of how many stay at home moms try to re-enter the job market once their kids get older! Having a resume gap is not so unusual, so don't make it seem to be unusual. If you took advantage by using the time between jobs to improve your skills or otherwise make yourself into a more valuable candidate. Put a positive spin by explaining how you were selective when targeting companies or contemplating job offers. If your resume gap overlaps a period of difficulty in your entire industry or your country's economy, mention it. Or- perhaps you weren't job searching the whole time but there was a major event in your personal life that required extraordinary attention. ‘Going historical' works especially well if the job interviewer can empathize because they may have experienced the same event. How? By listing directly on your resume what you did during the time between jobs, especially if the time was regularly spent in a framework such as a school or volunteering program. Resume gaps stand out in a chronological resume, the classic resume type that details your work history over time and, by literally reading between the lines, your non-work history. Using a functional resume emphasizes your skills and achievements over the aspect of time. By job searching intelligently so that you don't need to search longer than necessary. Improve your job search skills before you need them, at the very least by following blogs like JobMob even while you're still employed. Jacob Share is the job search expert who created the award-winning JobMob, one of the most popular job search blogs on Earth, with over 12 million visitors since 2007. JobMob is filled with straight-talking advice and humor based on Jacob's real-world experiences of finding jobs in the US, Canada, France and Israel.